No Excuse for Single-Use -The Cup Stops Here! 23rd November 2018 Jason Markwick Industry News, Marketing, What's New? 2017 marked the 30-year anniversary of the arrival of the modern disposable cup. It’s reckoned that in those three decades of avid coffee drinking more than a staggering two trillion of them have ended up in a landfill. It’s also reckoned that the average lifespan of a single-use cup is about ten minutes. Owing to the plastic content (in the liner to make the cup water/coffee proof) less than 1% of the cups get recycled, partly because there are very few recycling plants that can actually handle cups with a plastic liner. The alternative to this environmental headache – promotional travel mugs. E-Coffee Cup – Made with fibre from the world’s fastest-growing, most sustainable crop – bamboo. It’s BPA and phthalate free and naturally sterile, with no plastic aftertaste. Cups have a re-sealable, non-drip lid. The whole product is dishwasher safe but not suitable for microwaves. 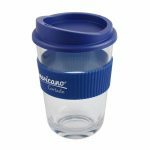 Americano Cortado – is a brand new UK-made tumbler which has a glass-like appearance with exceptional clarity. 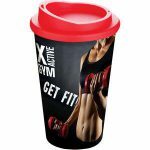 Brite-Americano Mug – For an amazing impact the Brite-Americano offers a full-colour wrap print. Complete the look with a screw-fix lid in a choice of twelve colours. 350ml capacity. BPA free. 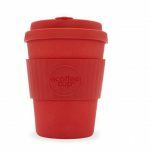 PLA Coffee Cup 350ml – This cup is a sustainable 350ml tumbler with silicone grip and lid. Manufactured from 100% biodegradable plant material (PLA). Cups are BPA free and dishwasher proof. 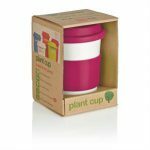 Arcadia’s range of travel mugs and promotional cups are environmentally friendly and can be used at work, home and on the move. They’re hardwearing and ideal for all sorts of drinks, both hot and cold. Perfect for branding with logos and graphics. Talk to Arcadia for more information, quotations and visuals of how your cup would look!